I've wanted to write this post for a while now, an almost memoir to my Husband. In my opinion, he is pretty flipping awesome. In fact, this evening after dinner, he said to me "You don't seem right, would you like me to bathe the kiddies?". This isn't unsual, he loves being involved as much as he can and takes his role pretty seriously. A lot of my friends are often amazed at how much he does, but to us, it's just the norm. We both are parents to our children, we both feel that we should be raising them equally. We also both feel it's important to have a career. It's hard work and it takes a lot of planning and teamwork. But isn't that what marriage is all about? Team work, supporting each other? Since my return to work, we seem to now work in sync with each other (I will be doing a video all about my return to work shortly), including the parenting. I'm so thankful to him. Whilst I'm at work he will have them most days and he does such an amazing job, I know many men will do the same, but I am constantly told how lucky I am to have such a hands on Husband. They're right, I am and I can take that for granted sometimes. When Darcie was born he was thrown into fatherhood. I was left pretty immobile after my emergency c-section and so he was kind of forced to be hands on. I will never forget when he changed Darcie's nappy for the first time. Constantly asking the midwife if he was doing it ok, whether the black gloopy poo was normal. I couldn't help but beam up at him, he was asking all the right questions and genuinely wanted to make sure he had "got this". I knew from that moment he was going to be the most amazing daddy and look after us all. 1) Family Orientated - As I said he is career minded, he has worked so hard to get to where he is and I am incredibly proud of him. But he has done it all, whilst maintaining a strong presence at home. He always weighs everything up, questions how it will impact us as a family - We always come first. 2) Does his share of the "dirty work" - Doesn't mind changing nappies, clearing up those sick bug mishaps and potty training whoopsies. 3) Engages in their learning - From teaching them to crawl, talk, walk, write - he's been involved in it all. As I write this Darcie and my Husband are currently singing the Jolly Phonics songs. 4) Want's to educate himself - If he isn't sure on something he will ask, or research on what's best. He has done this recently since I've gone back to work when he's been worried about weaning. He will often say "I gave Henry this to try today", followed by "Don't worry, I made sure it was safe to give it to him". 6) Supports me - This is a big one. He will encourage me to do the things I love, the things I want to do. 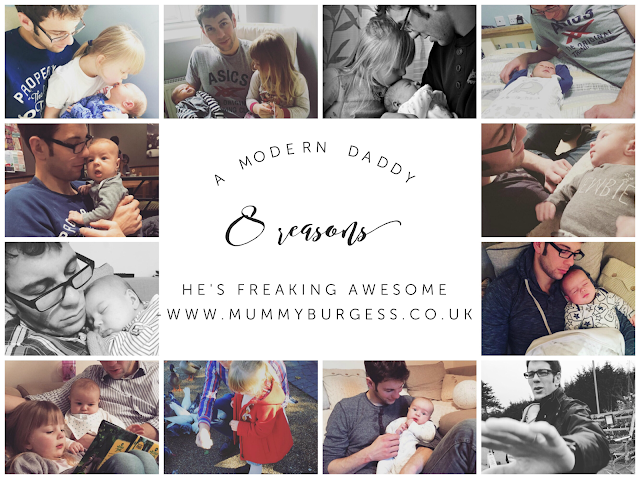 Whether it's breastfeeding or blogging he motivates me and pushes me to keep going - even when times are tough. 7) House Husband - Ok he doesn't stay at home, but he helps maintain the house! He helps with cleaning, cooking and general chores - he's a saviour! 8) Takes care of us - When you're feeling poop, he is just the kind of person you need. He has such a caring side to him and constantly feels like he's looking after us all. Of course, I could ramble on all evening about how amazing he is and I'm not writing this to boast, but more to appreciate all that he does.